Developed through extensive research and product development, our proprietary SMART™ process envelops particles at the microscopic level in a protective shell. This value-added coating technology delivers superior performance and stability of essential nutrients for a wide range of multi-functional ingredients. In addition to its innovative design, all SuperCoat® nutrients are rigorously tested throughout the entire production process, and are quality checked to ensure purity, potency and performance. With SuperCoat® you can protect the sensitive nutrients in your products from extreme processing environments. Products using SuperCoat® maintain nutrient integrity, thereby reducing ingredient overages. 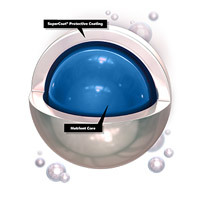 SuperCoat® microencapsulates eliminate or greatly reduce off-notes typically associated with potent nutrients, simplifying flavor formulation.